A few words about our driver - Vartan Samsonian. Vartan is 54 years old, married with three children and 5 grandchildren. He is a "driver" by profession -- but, in reality, he was our entertainment, and the key to our ability to see things in Western Armenia that few people will ever see on a trip like this. Vartan has been driving tourists throughout Western Armenia for over 10 years. In 2000 and 2001 he drove a group of Armenian historians and scientists through Western Armenia. The group explored in detail all of the ruins known to exist from ancient Armenian history to the present. Some of those places are so tucked away that one would not even know they are there without having Vartan with you. In fact, as we learned on our return to Istanbul and during our visit at the Armenian Patriarchate, even the Grand Sacristan (who serves in the place of the ill Patriarch) did not know that one of the old churches we visited existed! (Stay tuned for a later blog talking about this site). Vartan drove us along bumpy, steep roads that were meant for horses and carts, taking us to some of these sites. He pointed things out to us high on the mountain peaks. He frequently stopped along the road pointing out the window and telling us in Armenian - "get out, take a picture!" Vartan knew more people along these roads, some desolate, than we could ever imagine. We would be driving along, and he would suddenly stop, open his window and yell out to someone standing on the side of the road -- a friend he had met on one of his prior journeys. When he needed directions, he would get out of the van, walk over and shake hands with someone on the side of the road, and before you knew it the man was his friend! Sometimes, the new friend would jump in the van, and give us directions to where ever we were going. In Van, he knew the shopkeeper who had a vegetable stand on the side of one of the roads where we bought vegetables. He knew the young Kurds and half Armenians who ran the concession area at the bottom of the Van fortress. 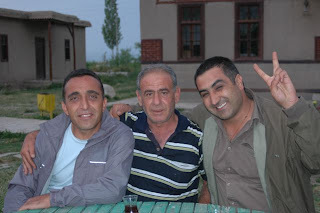 In the picture below, Vartan is in the middle. On one occasion, as we approached the city of Mush, Vartan suddenly stopped the van in the middle of the highway and backed up a couple of hundred yards. On the right side of the road, on the top of a small ridge, was a bee keepers shack, with bees in their blue boxes. Sitting next to them were some men, and a few children. Vartan started shouting at one of the men -- and that man came running down the hill yelling back at Vartan. We could not believe our eyes or ears -- this man -- in his thirties -- was speaking ARMENIAN to Vartan -- who jumped out of the van and ran over and began hugging him like a brother. As it turns out, this man is Armenian, and recently began learning to speak Armenian in this Kurdish town. His grandmother was Armenian and told him about the genocide. He was a music writer, and a bridge builder. He joined us in the van, along with 4 medium sized fresh fish from the local river, and went into town with us. Later, we had dinner of lahmajoon and fresh fish, and visited with Vartan and his friend. 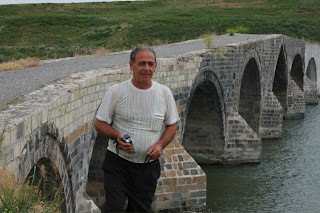 In the picture below, Vartan is standing at the bridge in the area of a famous battle in the early 20th century took place. The Armenian hero Kevork died and was buried in this area. Stops for petrol were never dull. Not satisfied with filling the tank with gas, and occasionally a good car wash, Vartan would occasionally befriend the petrol station attendants. That led to filling our bladders with tea -- there we were, sitting around in plastic chairs in front of the filling station, drinking "chai" with the filling station attendants. Hospitality in Turkey is not lacking by any means! On the road to Gaziantep, we stopped at a rest stop for a picnic lunch -- after Vartan spoke to the gentlemen running the little snack job, they quickly delivered water, plates, glasses, napkins and silverware to our table. We enjoyed soujouk, cheese, bread, cucumbers, tomatoes and watermelon -- and the shop keeper and his friends enjoyed the leftovers as we drove off. Vartan also became friends with the Jandarma where ever we went. Thank goodness, because we were driving a van with an Armenian license plate, and an Armenia flag stuck to the middle of the windshield! Along most of the roads in southern and eastern Anatolya, we would frequently come upon a Jandarma stop -- sometimes they would wave us on. Sometimes we would have to stop and our guide would provide the young soldier at the window with our passport information. In Van, we were stopped by the local "poliz" because Vartan was driving 3 kilometers over the speed limit. We sat at the side of the road for 15 minutes, while the officers in blue and white uniforms talked with Vartan, checked his papers, rejected an offer of packs of Armenian cigarettes, and finally settled for 30 Turkish Lira - on the spot. Vartan and Marina told us how they kept a couple of bottles of vodka in their small refrigerator for the border guards between Georgia and Turkey -- the only way one can drive from Armenia to Turkey is through Georgia. On the road out of Mush, Jandarma stopped us - and Vartan disappeared inside a building, for what seemed forever. Gradually, we each climbed out of the van, and congregated around the gate, hoping that we looked ominous enough to scare the young soldiers into returning our driver to us. After about 20 minutes, Vartan finally came out, shaking hands with each soldier as he walked toward our van. We sighed with relief as he jumped into the driver's seat, began playing Armenian music very loudly, reached over and shook Marina's arm, and shouted at the top of his voice "Hye Enk!" as we drove off. As we drove toward Elazig, Vartan slowed down and stopped at a checkpoint. The young soldier approached the window and Vartan started speaking in "Italian" - complete gibberish -- when the soldier asked him in Turkish "What did you say??" Vartan responded in Armenian "Barev!" ("Hello") -- the soldier, looking bewildered, waved us on, probably glad to see us go! We drove off, all of us laughing hysterically - and relieved that we didn't end up in a Turkish jail! But, the best experience we had with Jandarma came near the end of our trip to Western Armenia. Once again, we were stopped at a check point. This time,Vartan started out with his Italian gibberish. The soldier didn't buy it. Vartan then told him in Turkish that we were tourists -- the soldier still looked at him as if that wasn't enough information. So, Vartan asked the soldier if they had "tea" - he responded "yes" and the next thing we knew, all of us were marching out of the van, over to the covered patio adjacent to the soldiers' shack, and past a guard above us on a tower - holding a machine gun. One by one, each of us was called by one of the soldiers to fill in paper work about our passports, our father's and mother's name, etc. Amazingly, about five minutes into the process, a young soldier walked out of their shack with a tray of tea and sugar cubes, and served each one of us a glass of tea. We simply could not believe that Vartan had managed to charm these guys (some of whom spoke some English) into serving us tea at the checkpoint. Once the paperwork was finished, they shook our hands, wished us a good journey, and escorted us back up the road to the van. Vartan is an aggressive driver -- no winding, narrow road is a challenge to him -- as we sat with our eyes closed much of the time, he maneuvered paths that a Smart Car would be challenged to maneuver! In Mardin, Vartan made a 3-point turn on a high, narrow road, with the front of the van facing a chain link fence that was the only barrier to the steep incline below us -- we all expected to go flying off that road as he put the van in gear and backed up a few inches to make the turn heading down the road! But, once again, we made it. He had no fear passing huge trucks on the many winding mountain roads we drove, most of which were lacking asphalt and under constructions. Those roads ... it seems 1/2 of the roads in Western Armenia are under construction, from one end to the other! Vartan is a real patriot of Armenia -- even though he did not speak any English, Vartan communicated with us in song, dance and occasional shouts of Armenian patriotism. He passionately expressed his frustration and anger at how our Armenian churches were left to the dogs, cats, cows, mules, and builders of homes who used the stone khachkars as decorations. He told us stories of famous patriot war heroes (translated by Marina and Debbie) and showed us the gravesight of some of them. We stopped at sites of famous battles in the early 20th century. Not one of us left Western Armenia without the knowledge that, if Vartan could find the way, Armenia would once again include among its borders all of the towns we were visiting ... historic Armenia. On our last evening in Erzurum, Vartan told us that we had traveled in distance nearly 4000 kilometers (3000 miles) during our travels to Cappadocia and Western Armenia. Although occasionally hair-raising, we covered that much area thanks to Vartan, his love of his country, his enthusiasm for sharing it with other Armenians, and because he loves what he does. Hye Enk! Shad Shnorhagalenk Vartan!